Manchester United are set to visit John Smith Stadium in Huddersfield for the FA Cup fifth round tie on Saturday, 17th February 2018 against Huddersfield Town. Its massive game for Manchester United who are coming into this game on the back of a 1-0 defeat in the hands of Newcastle and they play Sevilla in midweek for the Champions League tie. FA Cup is their realistic hope of some silverware and Mourinho is likely to field a very strong lineup on Saturday evening. The game kicks off at around 17:30 uk time and BT Sports has the live coverage rights in the UK. Huddersfield Town stunned United when last time these two meet back in October at the John Smith Stadium. Mooy and Depoitre were on target in what was a historic win against the biggest club in the world. 28′ 1 – 0 Aaron Mooy scores just before the half hour mark after De Gea could only parry a shot on target in the patch of Mooy who made no mistake from 3 yards out. 33′ 2 – 0 Laurent Depoitre doubled Huddersfield’s lead minutes later after Lindelof failed to clear simple goal kick and Depoitre rounded de gea to make it 2-0. Jose Mourinho came under massive pressure since that cagey 0-0 draw against Liverpool over the last weekend and United’s performance did not improve in Champions League game against Benfica even though they won the game 1-0 thanks to Rashford’s cheeky freekick. Now they must put on a show and beat Huddersfield convincingly which will keep them within two points off Manchester City (if they also win against Burnley). 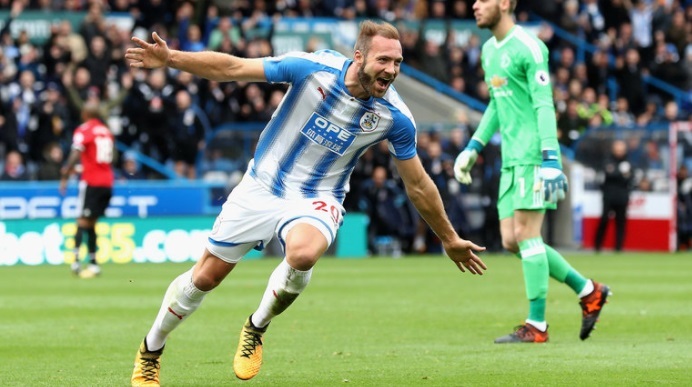 Huddersfield started the season strong but off late Premier League intensity has hit them as they have not won a game since than 1-0 win in the second week of premier league. Team News & Lineups: Manchester United are depleted with injuries going into this game and Marcus Rashford is also in doubt after injuring his knee against Benfica. Fellaini and Pogba are already ruled out while Michael Carrick might be fit enough to start in midfield. Lukuaku has failed to score in his last two competition games for United and will be eager to get back on scoresheet against Huddersfield. 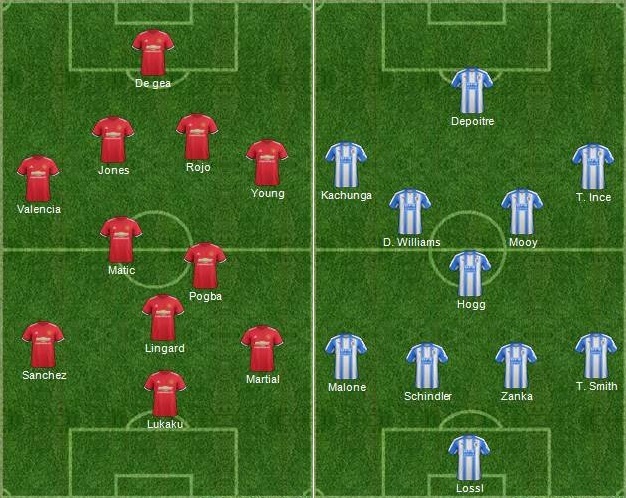 This is how I expect both teams to lineup on Saturday afternoon. Confirmed team news will be available atleast 1 hour before the kickoff. Match Predictions: United have won 10 of the last 12 competitive games this season scoring 33 goals in process and I can’t see them losing any game yet. 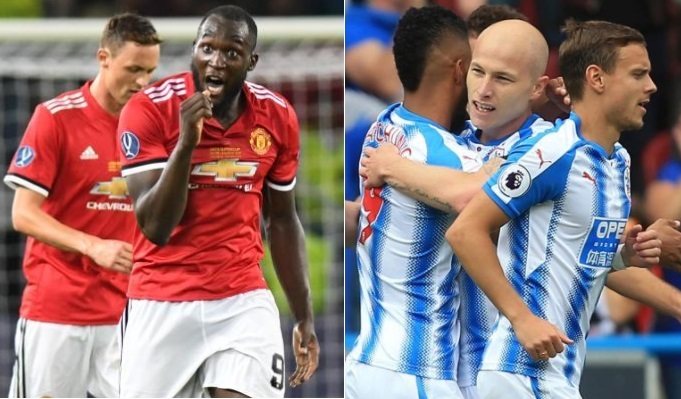 Huddersfield town are a team who will surely make a few upsets this season but United under Mourinho are too hard to beat as the early season results suggest. even without several key players United should just win three points probably by a narrow margin on Saturday.